Summary BYOD four-bay Marvell-powered SATA NAS with dual Gigabit LAN, USB 3.0 and eSATA ports. The TS-421 is the new top-end of QNAP's four-bay Home & SOHO line. It's very similar to the TS-420 that was introduced with seven other models in April. All four members of the TS-x21 series use 2.0 GHz single-core Marvell CPUs with 1 GB of DDR3 RAM, while the TS-x20 series models have 1.6 GHz single-core Marvell CPUs with 512 MB of DDR3 RAM. Both series have 16 MB of flash. Both lines include four-bay rackmount servers (TS-420U, TS-421U). 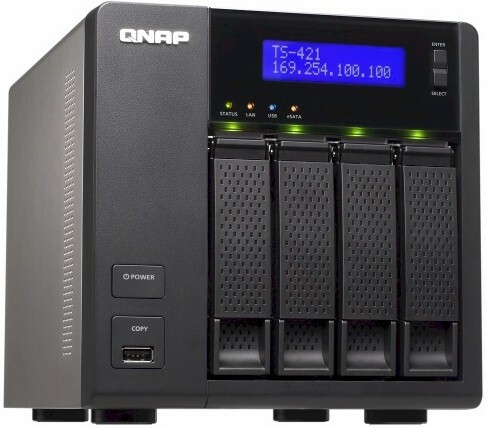 From the front side, the TS-421 looks very similiar to other recent QNAP NASes. Its primary distinction is the LCD status panel that's missing from the new TS-420 and older TS-412. The 421's key hardware features are called out in the diagram below. While the 421 has neither VGA nor HDMI port for an attached display, it has two each of Gigabit Ethernet, USB 2.0, USB 3.0 and eSATA ports. The 421's Marvell 88F6282 has a heatsink due to its higher 2.0 GHz clock rate, while the 412's 88F6281 clocked at 1.2 GHz does not. I've summarized all the 421's key component information in the table below, along with the 420 and 412. Firmware at test time was 4.0.1. This makes the TS-421 the first QNAP product we've seen with the new QTS 4.0 operating system. The change is significant enough that, as we have done with Buffalo's and NETGEAR's recent NAS OS revamps, Craig has done a separate detailed review. In the meantime, the screenshot below provides a peek at QTS 4.0's design. QNAP has taken a "virtual desktop" approach very similar to Synology's DSM 3 and refined in DSM 4. So if you've been having a hard time deciding between QNAP and Synology, QTS 4.0 is going to make your job even harder. QNAP's style is more tablet-friendly than Synology's with big icons sitting on the desktop to take you to key functions. QNAP has some tweaking to do, however, since I found myself constantly resizing windows to make them fit on 1280x1024 screens. If dealing with multiple windows isn't your thing, you can use the little display icon at the extreme upper right to switch to tabbed mode. While testing, I found a few differences from previous QNAP tests. I wasn't able to browse to the 421's SMB/CIFS shares using Win 7's network browser. But the shares came up with no problem when I entered the UNC path (\\ipaddress) in the Run box. I also ran into trouble when trying to test rsync backup performance. The 421's backup wizard let me connect to my standard DeltaCopy rsync target just fine. But it would not display the target volumes so that I could select one and would not let me enter a volume name manually. A remote session with a QNAP product specialist managed to get the 421's hostname to show up in the network browser of some of my Win 7 systems, by changing the Workgroup name and setting the NAS as local master browser. But I'm not sure this is a reliable fix, since one of my computers still doesn't show the NAS in its network browser. The specialist also entered the rsync target configuration by editing the rsync.conf file directly via SSH, so that I was able to run the test. He thought the problem was that DeltaCopy was taking too long to respond to the 421's query for target volumes—a problem he had seen in other instances. But I had not encountered this problem in previous QNAP tests, so I'm considering it a QTS 4.0 bug. I have been calling out manufacturers who still rely on CD-based installation processes. QNAP has responded with QTS 4.0's Quick Setup process. All you need is a working internet connection and to point your browser to start.qnap.com. Once there, a wizard takes you through the whole process, which I documented in the gallery below. To further check out QTS 4.0, see the online demo.